Brings a new and innovating cuisine to Los Cabos. Which is called Pacific Rim, featuring a fusion cuisine from the Asian part of the Pacific. Indulging their customers with exotic dishes and creative food Pitahayas gained a lot of respect from its competitors. In 1999 the restaurant received the prestigious 5 Star Diamond Award from the American Academy of Hospitality Sciences and it is the only restaurant in Los Cabos which achieved to receive this award for 9 consecutive years. Savor creatively prepared dishes from world-renowned chefs with the freshest of local flavors. Menus designed to delight featuring artfully prepared regional specialties are a mainstay of every Esperanza culinary venue. Cocina del Mar is known for its exquisite variety of fresh fish and seafood specialties. The Office on the beach is, as always, the place for breakfast, lunch or dinner Cabo-style where enjoy classical informal elegance with one feet firmly planted in the sand, year-round and from 7am to 10pm. The 16-ounce Office Margaritas are almost as famous as its traditional Mexican kitchen and fresh local fish and seafood. As soon as you walk through the entrance of this oldest adobe building in Cabo San Lucas or San Jose del Cabo, you know you are in for a treat: as you walk through Mi Casa you are immersed into a world of Mexican artesian architecture and decoration Easy to do: their tequila selection features the best of that unique maguey spirit from Mexico and their house margaritas are off the charts. Casa Natalia’s full-service restaurant, Mi Cocina (My Kitchen), provides a unique, sophisticated addition to the dining scene in San Jose Del Cabo. Under the auspices of Executive Chef and owner Mr.Tenoux, who artfully combines local ingredients with a wealth of international experience, Mi Cocina excites the senses and tempts the palate with its innovative Euro-Mexican cuisine. Serving authentic Baja California regional cuisine, dining at Edith’s overlooking the Cabo San Lucas Bay is a memorable event. No detail is overlooked, as Edith’s ambiance offers colonial touches, lanterns, palapas and fresh flower displays. Start with Edith’s award winning and best Caesar Salad in all of Mexico and enjoy the finest meats, fish and seafood cooked made to order as well as organic produce from local farms. Award-winning Owner and Executive Chef Tadd Chapman of Don Sanchez was voted Chef of the Year 2010 and for great reasons. His is a style that takes a lighthearted approach to cooking, sticking to classic recipes for a foundation but adding a little creative Mexican zing to blend their seemingly disparate culinary traditions. The result is what is considered to be one of the best Mexican-fusion restaurants found in all of the state of Baja California Sur, let alone Los Cabos. The signature restaurant at the Hacienda Beach Club & Residences at Medano Beach, merges traditional Mexican architecture with casual beachfront dining for an elegant, laid back experience. Perched on the most beautiful quarter-mile of beach and overlooking the iconic rock formations of Land’s End, this restaurant features open air indoor dining, outdoor dining on the terraza, and beachfront palapa bar. Tequila’s menu consists of the finest and freshest seafood, beef and poultry. Vegetables are locally grown on organic farms. The variety of dishes shows an innovative blend of Mediterranean, Asian and Mexican influences that delight the palate. All dishes are prepared either grilled or in a wood burning oven in order to maximize flavor. Contemporary Mexican Cuisine with a passion for Seafood set in the most artful Colonial ambience in all of San Jose. Five star Regional Seafood cuisine prepared by award winning Chef/co-owner Jacobo Turquie, a graduate from “The Culinary Institute of America” in New York. A Seafood Restaurant like La Panga has been long overdue in Los Cabos. From the moment you arrive you are welcomed by the hospitality of Edith, one of Baja’s most famous chefs in San Lucas. Guests can enjoy a variety of pizzas, salads, fresh Pacific ceviche and the best Pico de gallo in Baja. Ramuri is known for its Artisan cerveza and craft beers made on site. Take a tour of the brewery and enjoy the roof-top terrace. International Gold and Silver Award for Quality 2003. Full bar, Sake and Japanese beers. 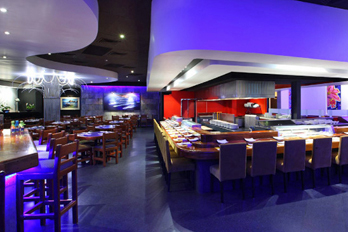 Nick-San is not just the most popular sushi restaurant and bar in Los Cabos, it is recognized around the world and best defined for serving, Stylistic Sushi and Seafood Dishes. Nick-San is definitely the most exquisite, open-aired, sushi restaurant and bar a person can hope to experience, at least once during a lifetime in Los Cabos. One of the first-class restaurants in Cabo San Lucas; Bar Esquina features a unique twist on International creative cuisine. Mexican influenced with Mediterranean flavors using locally grown organic produce; fresh fish from the Pacific & Sea of Cortez and the highest quality meat cooked on a mesquite grill. Bar Esquina is quickly becoming one of the finest Restaurants in Cabo. From the quality and freshness of every ingredient to the art the restaurant impresses in each and every preparation, Artichokes Heart goes to extreme lengths to delight our customers with both local and imported products which are served immediately after they come into our hands. A relaxed, yet sophisticated environment, Artichokes Heart is the perfect place for business, for meeting with friends and for sharing with your loved ones.